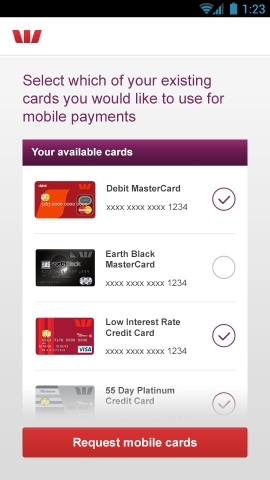 The mobile payments service announced today by Westpac and Visa uses near-field communication (NFC) technology. NFC chips are included in several major Android smartphones, though the bank didn’t specify exactly which phones will be compatible. Users will be able to store all of their Westpac debit and credit cards—Visa and MasterCard—in the existing Westpac banking app. Westpac said transactions “will be protected by multiple layers of security, just like a normal card transaction”. The commercial rollout on Android handsets uses embedded secure elements, it said. The impending release of the service follows a successful internal trial at Westpac. Westpac chief product officer David Lindberg said contactless payments have taken off in Australia this year and the bank believes that mobile payments represent “the next big step”. "People are rarely separated from their mobile phones, and this delivers new, simple ways to pay for everyday shopping,” he said. The Westpac service is different from mobile contactless payments services announced recently by Commonwealth Bank and Coles, which rely on NFC stickers. CommBank has said it will soon also support payments using NFC chips in certain smartphones, following the rollout of its sticker system. While requiring users to attach something to their phone, the stickers approach has the benefit of being compatible with phones that lack NFC chips, which notably includes Apple's iPhones. "Westpac has trialled the use of stickers for mobile payments but has decided not to roll them out to customers,” Lindberg said. “Westpac continues to support all handset providers and will be excited to support them when they do develop payment solutions for their phones in the future."